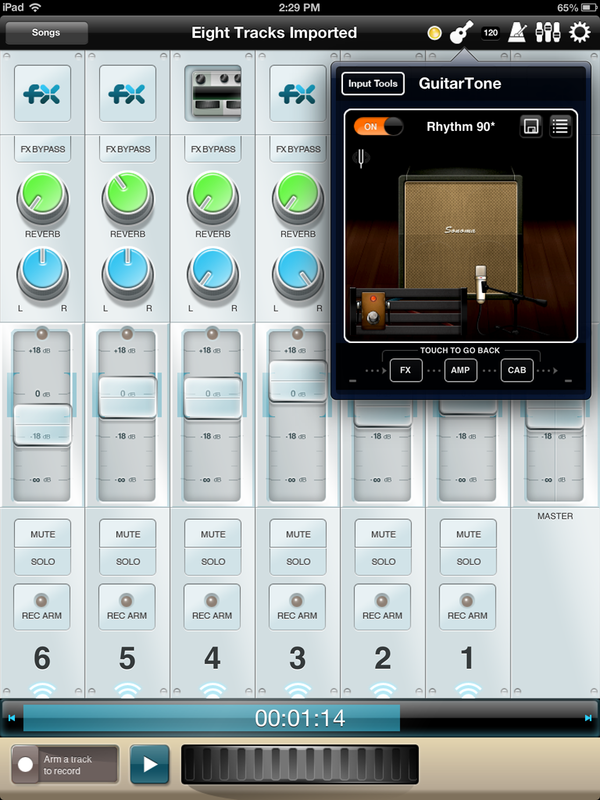 StudioTrack is a powerful multitrack recorder and songwriting tool designed exclusively for iPad. Works with the iPad built-in microphone, headset microphones, or compatible multichannel audio interfaces, like Sonoma's StudioJack Mini and GuitarJack Stage 2-in/2-out audio interfaces (recommended), which connect a wide variety of instruments and microphones to iOS/Mac/Win for the highest quality sound, ability to charge your iOS device while using StudioTrack, and more. Made in the U.S.A.! 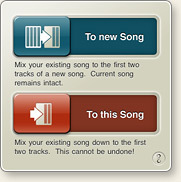 StudioTrack also works with compatible third-party audio interfaces. 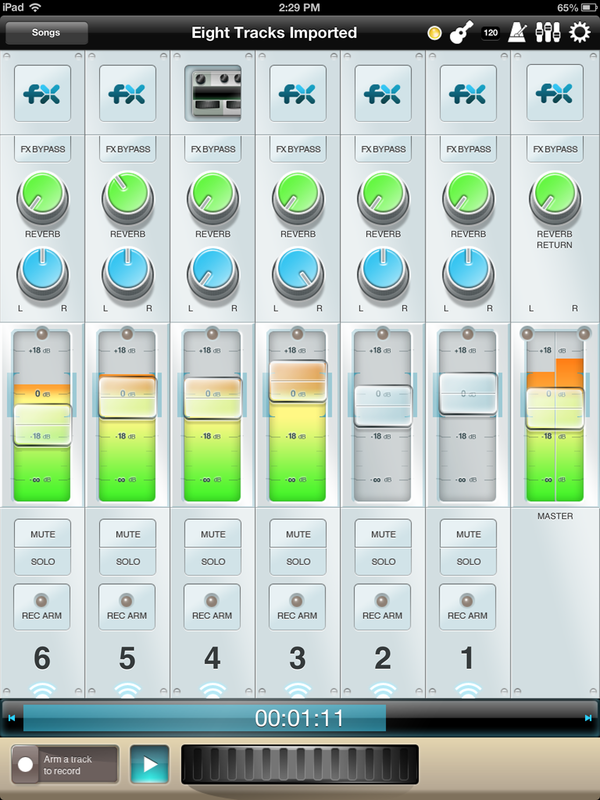 Record up to eight tracks on a lucious multitouch mixer with meters, faders and knobs. Control multiple parameters simultaneously, like an analog console. Rearrangable channels help you keep your tracks organized. Choose from beats by celebrity drummer Jason McGerr or samples of live drums and percussion courtesy of Discrete Drums multitrack drum library. Time signatures include 3/4, 4/4, 6/8 and X/4 (unaccented beats that can be used to play 5 ,7, 9 and other odd meters). Bounce your tracks to a new song and keep expanding your work beyond eight tracks while maintaining all the original recordings. Then Mix down right on the device and use DropBox to upload the mix and the original tracks to the cloud. StudioTrack has an effect rack on every channel which can be configured with a set of effects. Options include a tempo-synchronized double delay, a 4 band parametric EQ with Hi-Shelf, Hi-Peak, Lo-Peak and Lo-Shelf filters, a 1 band peaking parametric EQ and a compressor. The delay and 4 band EQ require more processing power, so they require both slots, while the 1 band EQ and compressor can be used together in any order. StudioTrack includes a built-in Reverb with send knobs on every channel and a Reverb Return level on the master section. It also includes a 4 band parametric EQ and a stereo-linked master compressor to help you create the perfect mix for your style. "We were frankly impressed with how good looking, responsive, and intuitive the app is (StudioTrack) -- GarageBand could really learn a thing or two -- and we multitracked our first session in minutes." Multitrack Recording - 8 tracks plus bounce. 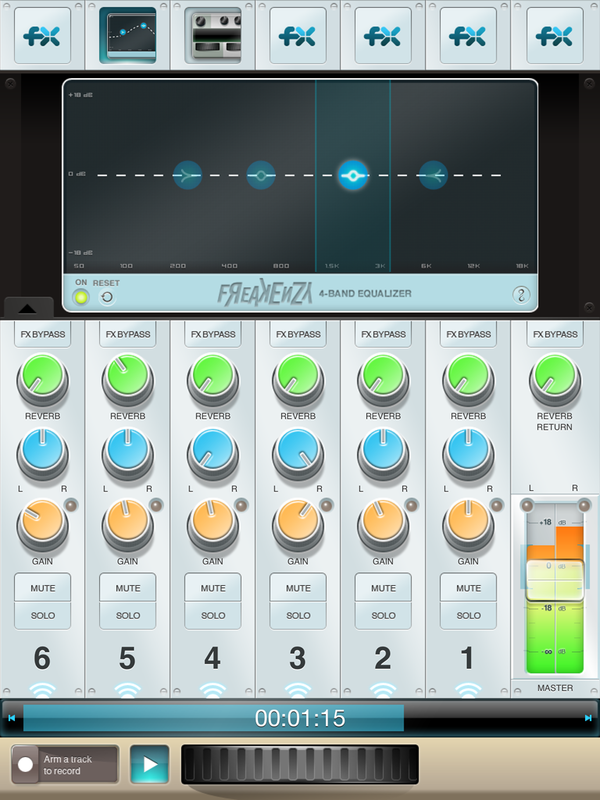 Re-arrangable Tracks with FX Bypass, Reverb Send, Pan, Gain, Mute, Solo, Record Arm and Track Icon. TrackFX - Tempo-synced Delay, Compressor, Parametric EQ and Reverb Send on every track. Calibrated Meters - accurately monitor record and playback levels. Calibrated Faders - accurately adjust playback level of each track for Cross-Fading, Muting, and Playback Control. MasterFX - sweeten the sound of your recordings with a compressor-limiter and a 4-band parametric EQ. Output Compressor-Limiter - automatically fattens sound of the output mix. Metronome - select tempo by number or tapping (includes pro drum recordings). Bounce - mix song to track 1 and 2 of a new song to record as many tracks as you want. WiFi sync or mix individual tracks to a computer then import into any software that imports WAV files. Slide-to-Record - prevents over-writing your tracks. Latency Compensation - accurate to within 1ms. File Import/Export - import audio into StudioTrack by opening an audio email attachment or by dragging audio files into StudioTrack's File Sharing area under Apps in iTunes. Supports wav, mp3 and aiff formats. StudioTrack's Sessions folder can now be dragged out of iTunes to the desktop. Requires iOS 4.0 and iTunes 9.2 or above. Input Monitoring - use StudioTrack's settings tool to enable/disable input monitoring. Input monitoring is enabled when a track is armed and in either Pause or Record mode. Playback of existing tracks overrides input monitoring. When input monitoring is on, sliders on armed tracks are enabled and control the monitor mix. Bass Response Correction - when set to AUTO, this will boost the bass response of the recorded signal when using the built-in microphone and headset jack, but not affect devices connected via the dock connector. Monitoring through FX - monitor with FX allows you to track your vocals and instruments with reverb, delay, eq, and compression non-destructively. Master Channel with Reverb Return and Stereo Output meters. GuitarJack Model 2 Control Panel - Adjust the input settings of the GuitarJack Model 2 audio input/output accessory. Select from 1/4", stereo 1/8" or both inputs simultaneously, and adjust input levels with 60 dB of analog gain control. GuitarTone Amps & Effects - 3 amps and 3 effects are included in the GuitarTone Song Tool in StudioTrack. Add-on AmpPacks and PedalPacks purchased in the GuitarTone iOS app are activated in FourTrack and StudioTrack on any device that uses the same iTunes account. Connect Sonoma's high quality 2-in/2-out interfaces, including GuitarJack Stage, StudioJack Mini, or their predecessor, GuitarJack Model 2, to get 12 more amps and cabs plus 12 more effects free. Free High Visibility Tuner - Fast, accurate tuning. TaylorEQ - Sonoma Wire Works teamed with Taylor Guitars to create an input EQ for enhancing the FourTrack and StudioTrack recordings of Taylor Guitars or any acoustic instrument. Select from a range of Taylor body styles in basic mode, or select the Advanced tab to adjust the 6 band parametric equalizer manually. (NEW in v1.5) GuitarTone Song Tool: The same 3 amps and 3 effects from the GuitarTone stand-alone app are now available as the GuitarTone Song Tool in StudioTrack. Add-on AmpPacks and PedalPacks purchased in the GuitarTone iOS app are activated in StudioTrack and FourTrack on any device that uses the same iTunes account. * Connect Sonoma's impeccable sounding GuitarJack Model 2 to get 12 more amps and cabs plus 12 more effects free, or buy them as add-ons. (NEW in v1.5) Song Tools State Indicator: Indicator lights are now visible when a songtool is currently enabled. (NEW in v1.6) Updated for iOS 9. (NEW in v1.6) Dropbox file sharing..
(NEW in v1.6) AudioCopy 3: Copy audio between AudioCopy 3 enabled apps. (NEW in v1.6) Support for GuitarJack Stage and StudioJack Mini. (NEW in v1.6.2) Enhanced support for GuitarJack Stage, StudioJack Mini, and their predecessors (GuitarJack Model 2 and GuitarJack 2 USB), as well as generic USB audio interfaces. (NEW in v1.6.2) Fixed a crash that could occur when arming a track for record with GuitarTone open. (NEW in v1.6.2) Fixed crash when touching "Get More Gear" button in GuitarTone. (NEW in v1.6.2) Fixed a bug where song screenshot was not being saved properly when exiting app. (NEW in v1.6.3) Improved support in Interfaces Panel for GuitarJack Stage, StudioJack Mini and their predecessors, GuitarJack 2 USB and GuitarJack Model 2. (NEW in v1.7) Updated for iOS 10, added AudioCopy 3, GuitarTone song tool improvements, and other improvements. (NEW in v1.8) Works with iOS 11, requires min. iOS 10.0, added GuitarTone 3 amps and effects, lowered latency (256 frame buffer size down from 512), updated Dropbox to V2, and fixed crashes. See StudioTrack Release Notes for more info. • StudioTrack 1.8 requires iOS 10.0 or later. 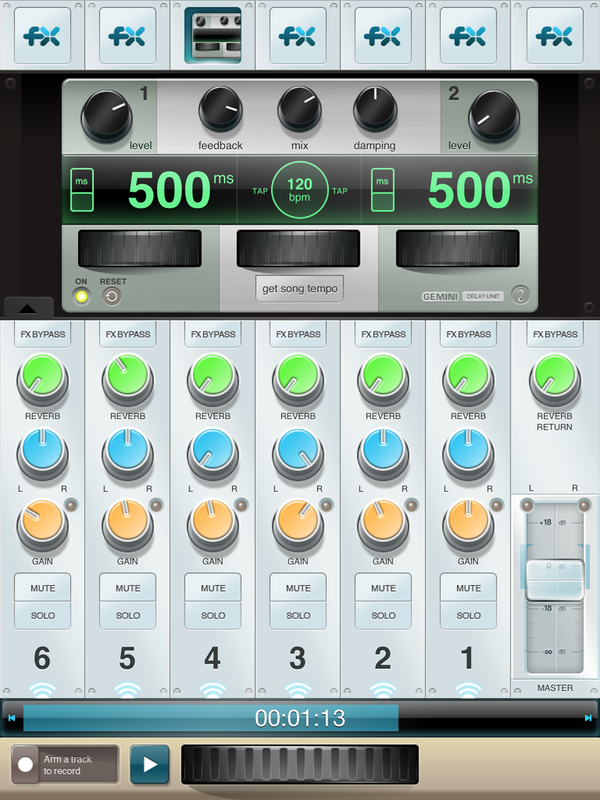 Earlier versions of StudioTrack are available for earlier iOS versions from Apple - See forum for tips. • Works with built-in mic/headphones, a compatible audio interface (e.g. 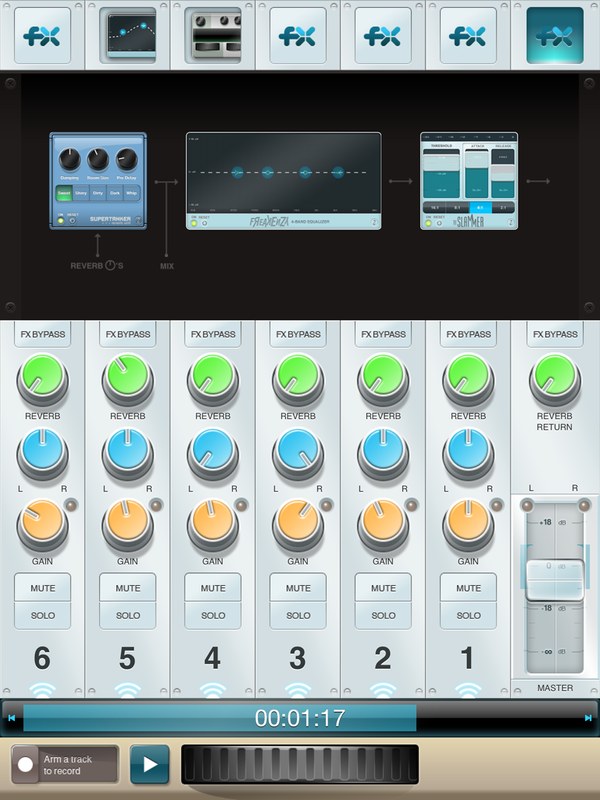 StudioJack Mini or GuitarJack Stage 2-in/2-out I/Os for Mac/Win/iOS are recommended), or other compatible third-party interfaces). 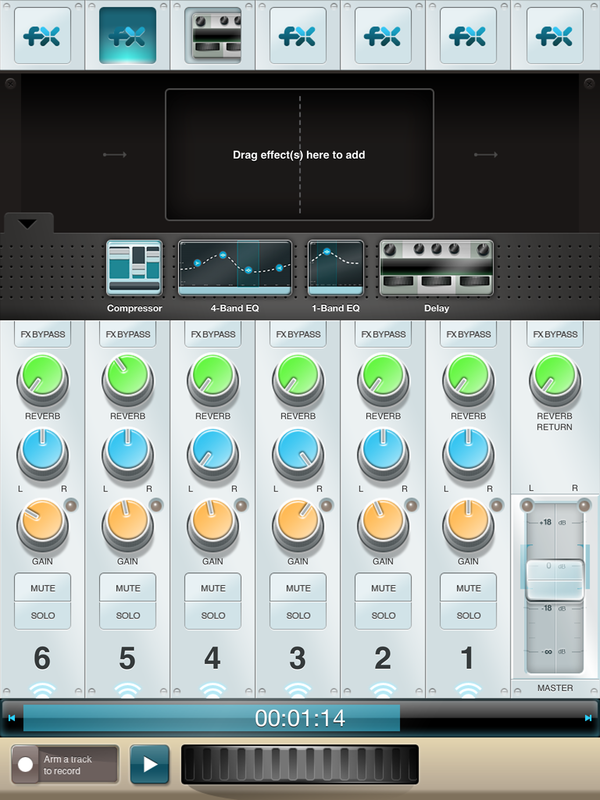 StudioTrack is available in the AppStore now for $9.99.